Now, I don't like that lot very much. Probably because growing up in an area where a lot of Essex boys supported West Ham, I got massively taken the piss out of for supporting Spurs. Not because West Ham were better, per se, but because there were more of 'them' than 'us', well, me. The whole 'Lasagna' thing didn't help either. Anyway, I have a massive hatred of them and enjoy beating them almost as much as Arsenal. So whenever there's a chance to laugh at West Ham, I do. Like when they went down, or when they signed Tevez and Mascherano and thought they were going to get into the Champions League etc. etc. Oh how I hate them. And I thought we could use this thread as an opportunity to post any amusing anecdotes any of you might have that make West Ham look a bit silly. Half my family support em. They're a cute little pub team from Dagenham. It is a good song to be fair but its funny that they sing a song about failiure when they win :lol:. If they escape relegation again this year I will be convinced they are paying the FA or something. I really want them to go down so I can laugh for at my mate until I get bored. They are our feeder club. I'd be laughing a lot more if they hadn't got 60% of their total points tally from us. Their stadium looks like it's made of Lego. Screw playmobil, turns out Lego are able to play a much wider range of roles and are a lot less prima-dona about the whole posing in costume thing. They're called Hammers. Which is a type of big tool. I laugh at clubs misfortune but not at injuries. Like when people hoped Berbatov would break a leg after going to Man Utd. Doesn't seem right to me. No no, you miss my point. I'm not laughing at Hitzlsperger. I'm laughing at West Ham as in the 'club'- the Chairmen and their fans. I think it's hilarious that they've spunked another tonne of wages on an ageing international (albeit younger than their usual spunking) that they won't get the benefit of. It's like Dyer. It's like Ljungberg. Their hypocrisy knows no bounds. Gold and Sullivan declare that they'll stop the ridiculous investment that went on before. A month later they're linked with Van Nistelrooy and Henry on mega wages. They really don't learn and it's brilliant. 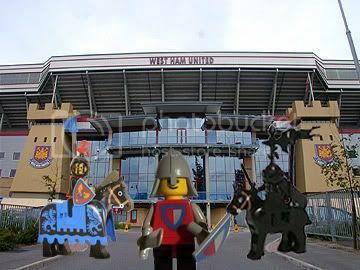 The West Ham thing is a funny one isn't it. A couple of years ago I was out drinking, and ended up getting into a decent conversation with some random guy. Turned out we had a few mutual friends and generally getting along well. After a while the subject turned to football, he mentioned he was a Hammers fan. I mentioned I was a Spurs fan. They hate us because Millwall arnt in the same league as them and Arsenal are a family club. I actually dont mind them. What does annoy me though, is when people refer to them as a 'cockney club', which they aint.